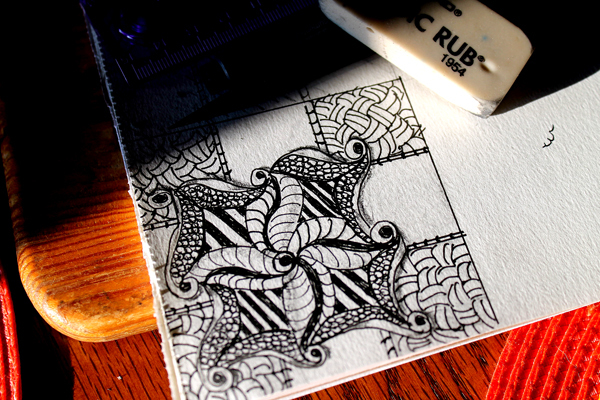 So what the heck is Zentangle and what does it have to do with gardening? Well, it's my latest way to keep from going stir crazy while I am trapped in the house because of the cold! When I don't have many gardening chores to keep me busy, I spend time in the art studio doing lots of crafty things. I discovered Zentangle a few weeks ago at my church's silent auction. A Zentangle teacher had donated some Christmas ornaments made with the technique and I was intrigued. My friend explained that it is a form of organized doodling! I did some research on the Internet and I am hooked! The one above is my first try. I did it on watercolor paper because it's what I had on hand. I plan to make some polymer clay blanks and make earrings and necklaces using this art form.